The Thomas Cooper Memorial Church has a long association with Lincoln. However, the present building only opened its doors in 1972. Prior to this the church building was situated in St Benedict’s Square, further north along the High Street, in the square behind St Benedict’s Church. This area now accommodates Marks and Spencer and the Wigford Way relief road. The church was built in the mid 1800s on the banks of the Brayford Pool, but when the building developed structural issues the church took an opportunity to move further down Lincoln High Street to where it can be found today. The very early history of the Thomas Cooper Memorial Baptist Church can be traced right back to the late 1500s and early 1600s when there was a split from the church (now known as the Anglican Church). 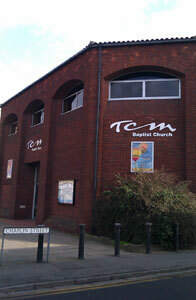 The name of the church we know now as TCM was not given until many years later. Those who had split from the Anglican Church became known as ‘separatists’ and as time went on there was much intimidation and persecution towards them. Consequently, in 1606, John Smyth (the leader of the group) and his followers were exiled to Amsterdam in Holland where they joined a group of people called ‘anabaptists’. They remained there until 1620, when some of the group sailed in the Mayflower, for New England. The others, after some time, returned to Lincoln where it was observed in 1626 there was a Baptist Church established which met in various places. The original Baptist Church was built in 1701 and was sited to the rear of St Benedict’s Square, between the old St Benedict’s Church and the River Witham where the river joins the Brayford Pool. The old church, known as the General Baptist Church, was a very small building with a burial ground backing down to the river and it was here people were baptised by immersion. Because of the need for a greater meeting area, in 1860 the church was rebuilt to accommodate this need. The congregation varied in number over the ensuing years going through lean times but also times of great blessings. In 1884, due to growing requirements, the original church building was demolished and a larger building constructed. The old building was then re-erected behind the new one at a total cost of £3000. The new church building was opened on 2 May 1886 and it was because of the ministry of one Thomas Cooper, chartist, historian etc., that the church became known as the Thomas Cooper Memorial Mission, and even later, the Thomas Cooper Memorial Baptist Church, where the Word of God was preached faithfully for a number of years. 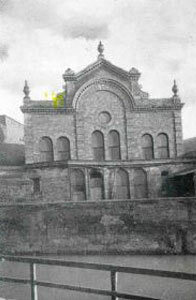 The original church building then became the meeting hall. By the late 1960s the 19th century building had developed numerous structural issues and the church officers and trustees at that time accepted an offer from Marks and Spencer, who wanted to develop their existing town centre store. 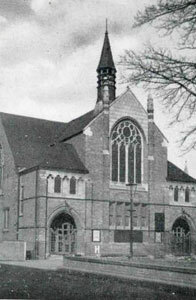 TCM subsequently acquired land on the corner of the High Street and Chaplin Street, and construction of the present church building was completed in 1972. The opening ceremony was held on 9 September, 1972, the speaker being the late eminent preacher and author Dr Martyn Lloyd-Jones from Westminster Chapel. Comprehensive details of the history of TCM can be found in a recently published book, A History of TCM: The Thomas Cooper Memorial Church, Lincoln (c. 1695–2015).